Investors should keep an eye on sales trends, free cash flow, and any news about J.C. Penney's recent return to the appliance market. J.C. Penney (NYSE:JCP) is scheduled to report its Q4 earnings results on Friday, and investors are hoping for more evidence that its multiyear turnaround effort is making progress. Here are three things that investors should keep an eye on. Are sales trends holding up? The most important metric for J.C. Penney investors right now is sales growth. Between 2011 and 2013, roughly a third of the company's sales volume disappeared after former CEO Ron Johnson tried to cut back on discounting. At its current level of less than $13 billion in annual revenue, J.C. Penney is just barely scraping by. JCP Revenue (TTM), data by YCharts. Recently, revenue has been moving in the right direction. Through the first nine months of fiscal 2015, J.C. Penney's comparable-store sales rose 4.6% year over year. For the November-December period, comp sales rose 3.9%, keeping the company on track to meet its guidance for 4%-5% comp sales growth for the full fiscal year, which ended a few weeks ago. However, Kohl's (NYSE:KSS) -- J.C. Penney's top rival in the mid-price department store segment -- ran into trouble in January. Earlier this month, Kohl's cut its Q4 sales guidance. It said that strong sales between Thanksgiving and Christmas "were offset by a very slow start to the quarter in early November and a weaker-than-expected January as soft demand for cold-weather goods led to lower store traffic in these more discretionary shopping periods." Sales slowed at Kohl's last month. Was J.C. Penney also affected? Just because Kohl's ran into trouble last month doesn't mean the same was true for J.C. Penney. Nevertheless, J.C. Penney and Kohl's are both national chains, so it's reasonable to expect similar weather impacts on both companies. 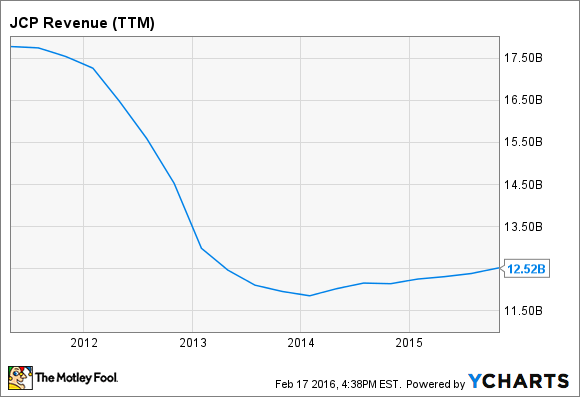 How much free cash flow is J.C. Penney generating? A second key question for investors is how much free cash flow J.C. Penney generated in Q4 and how much it expects to produce in fiscal 2016. In its sales update last month, J.C. Penney stated that it expects to produce positive free cash flow for the full 2015 fiscal year. Free cash flow is important for any business, but it's particularly essential for J.C. Penney because of its heavy debt load. The company had more than $5 billion in debt at the end of Q3 and it has been incurring about $400 million in annual interest expense recently. The more free cash flow J.C. Penney generates, the more debt it will be able to pay down. That will reduce its interest expense, boosting earnings and cash flow. This would allow the company to pay off even more debt, driving a virtuous cycle of rising free cash flow and falling debt levels. How is the appliance test going? Finally, investors should listen in to the J.C. Penney earnings call for any information about the company's recent return to the appliance market. At the beginning of February, J.C. Penney began testing new appliance sections in 22 pilot stores in the Tampa, San Antonio, and San Diego markets, more than three decades after discontinuing appliance sales. J.C. Penney is testing appliance sales in several metro areas. If this market test goes well, J.C. Penney will probably roll it out more broadly. This should provide a nice sales boost, particularly because the new appliance sections are taking over space that isn't producing much revenue right now. The appliance test began just a few weeks ago, but any information on its success so far could help investors judge the potential impact of this initiative.